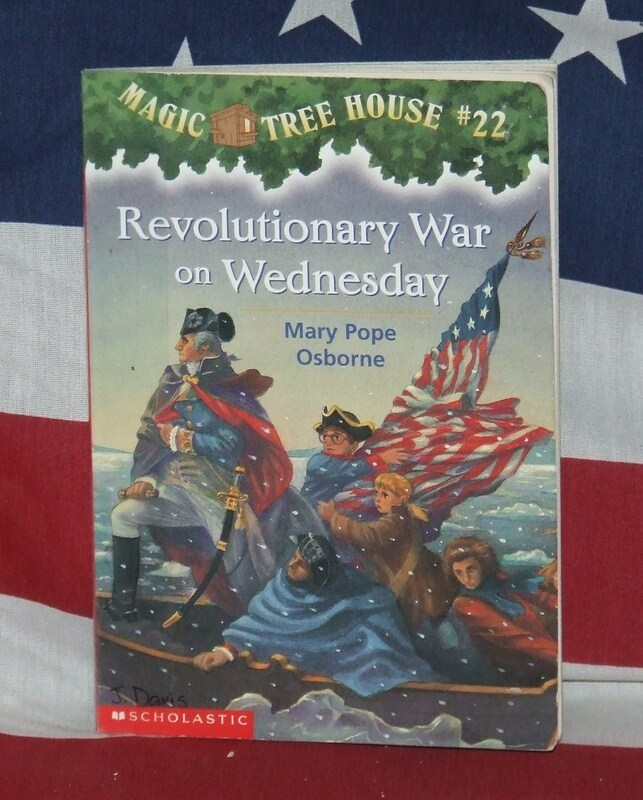 In honor of Memorial Day this week, I selected Revolutionary War on Wednesday because it features a war that led to America’s freedom and because my eight-year-old loves the Magic Tree House series. Since he enjoys reading them in order, I know he’s read at least 22 of them, because he recently finished this one. That’s a good sign that it’s a great series! He (and I) love how Osborne places her main characters, Jack and Annie, into the historical period, and we feel like we are with them in their adventure. Come join us, I mean them! On Sunday, they found something to follow from nurse Clara Barton, during the Civil War. Now it’s Wednesday and they must find something to send! The Captain, whom Jack and Annie met earlier among the Patriots, gives Jack a note with some quotes from this speech to send back to his family in case he does not survive the battle. Holding his note, Jack realizes he has what he needs for Morgan’s library, the something to send, and they can return home! But, he can’t find Annie. When Jack discovers her sitting on George Washington’s boat, he tries to pull her off, but it’s too late. They set off down the Delaware River in Pennsylvania with the 2,400 Patriot troops headed on their secret mission Christmas Day, 1776. “Jack looked at George Washington. And he does. The Patriot’s battle and Jack and Annie’s journey were both a success. A fun book with a lot of history, adventure and valuable lessons!
. . . Thankfully the story of this battle recorded in the history books tell us that very few lives were given in this secret mission, but many more people sacrificed their lives in this war and other wars. Memorial Day is important to every generation because were not obtained cheaply so we should not esteem them lightly! This entry was posted in America and tagged #22, 1776, Delaware River, Freedom, George Washington, Magic Tree House, Mary Pope Osborne, Memorial Day, Patriots, Pennsylvania, redcoats, Revolutionary War on Wednesday, Scholastic, The Crisis, Thomas Paine. Bookmark the permalink.